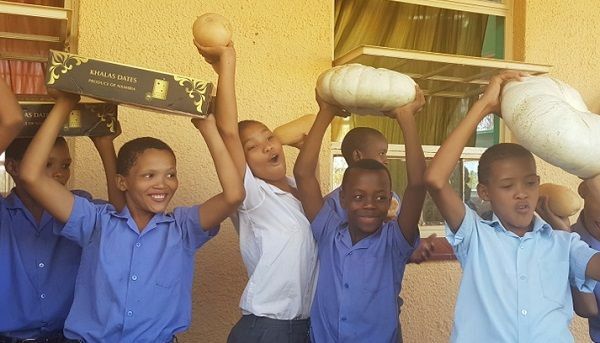 “There is a direct correlation between nutrition, growth and the performance of children,” said the Head of Education at Desert Fruit Namibia, Suzette Smit when the company presented a large consignment of fresh vegetables to an old age home and five schools in the Karas Region. “While Desert Fruit plants and harvests dates and bulbs for commercial export, we also grow various seasonable vegetables for our local staff. Over the past harvesting season, we had a surplus of pumpkin and butternut and decided to donate this surplus to a variety of institutions who do not necessarily enjoy the luxury of fresh, quality food, especially fruit and vegetables, on a daily basis” Smit continued. The vegetables went to Bet-Ell, Karasburg Combined School, Karasburg Primary School, Ernst Jager Junior Secondary School, Ariamsvlei Primary School and the Kenmekaar Retirement Centre. “Desert Fruit Namibia, as one of the largest companies in the Karas Region, will continue to take responsibility for the local communities through a variety of programmes, projects, donations and CSI initiatives. 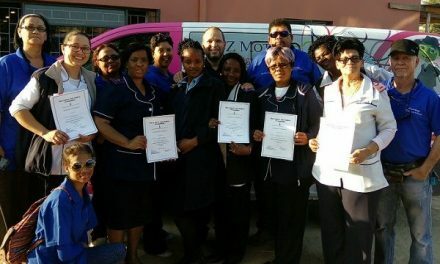 “We aim to look after the community we operate in and this includes as many community members as possible, with special emphasis on children and the elderly. Numerous other projects are underway, and education, skills enhancement and training are at the forefront of these projects,” concluded Smit. Desert Fruit is cultivating 22,000 date palms which is expected to yield about 3000 tonnes of export dates once in full production. It employs up to 450 people, some in permanent positions and others seasonally during the harvest period.